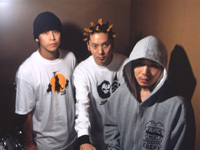 Japan's most aggressive band, The Mad Capsule Markets, formed in 1991. After releasing a single and an album on their independent label, they signed a contract with JVC/Victor Entertainment in 1991. They self-produced and recorded the band's official album "P.O.P", which was released in Japan in 1991. Following critical and commercial success with the release of all of their albums, especially since the 6th album rose into the top 10 on the major "Original Confidence" chart in Japan, their popularity has grown and is quickly spreading overseas. The band has toured extensively, playing to sell-out shows on each tour. They performed at SXSW '97 and in September of that year they participated at the CMJ Music Marathon. That same year they opened for Rage Against The Machine's and Helmet's Japan tours as well as performing at the Fuji Rock Festival, which featured Rage Against The Machine, Red Hot Chili Peppers and Atari Teenage Riot among others. They played with Pitchshifter in 1998 and with Fearfactory in 1999. Remixers have also been paying a lot of attention to the band: Germany's Alec Empire, the UK's Adrien Sherwood, America's Long Beach Dub All Stars, and Japan's Audio Active and DJ Krush all have remixed their songs. They released the maxi-single "Pulse" in July 1999, and their latest album Osc-Dis (Oscillator in Distortion) was out in August 1999. It reached the top of several record stores' charts. In January 2000, they released the single "Good Girl" (dedicated to Motokatsu's daughter) from the album Osc-Dis and set out on tour again. By virtue of featuring the song for a commercial message on TV, the band received even more commercial attention. Those who normally listen to conservative Japanese music began listening in. They continue to step into whole new realms with their music. Their digital, integrated sound takes you to the next level of heavy rock, one beyond the minds' grasp.